I can officially say that I have been on an Asian-inspired kick for the last few weeks. This recipe was created on a rainy night, when I had a bit of an upset stomach, and needed a belly-warming dinner. I don’t normally eat rice, but this was a special occasion. There are times to substitute low-carb alternatives (such as ground cauliflower for rice, radishes for red potatoes, or cashews for cream/flour). But sometimes you just need the real thing. All things considered, this rice bowl ended up being a nutrient-packed delicacy. 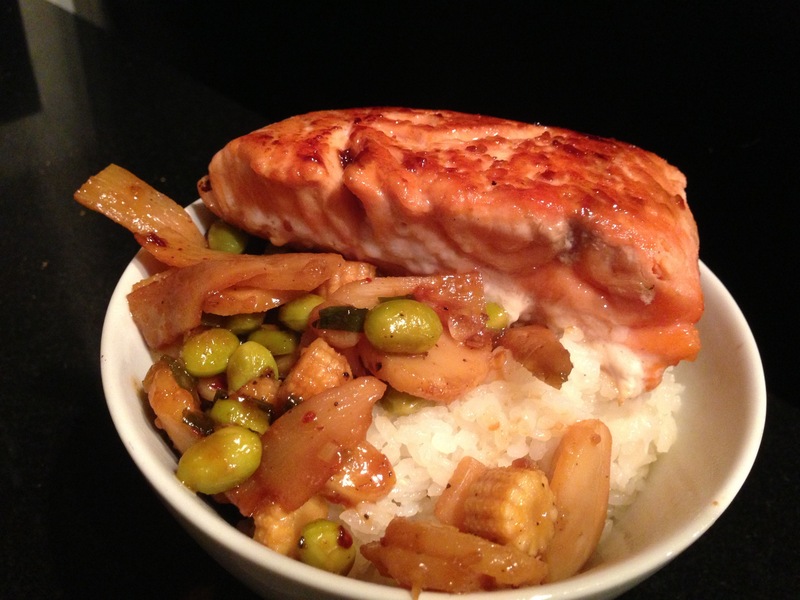 The salmon lent essential Omegas, edamame added extra protein, and coriander supplemented daily magnesium intake. Mix ginger, thyme, coriander, lime zest, and salt. Rub spice mixture on salmon filet and refrigerate for 30 minutes. Heat 1 Tbs olive oil in a large pan over medium-high heat. Add water chestnuts, bamboo, corn, edamame, and ginger. Season with salt and pepper to taste. Cook, stirring frequently, 8 minutes. Add garlic and cook an additional 2 minutes. Add 2 Tbs teriyaki sauce and red pepper flakes. Stir and reduce to simmer. Heat 1 Tbs olive oil over medium-high heat. Cook salmon, skin-side down, for 3 minutes. Flip. Cook an additional 2-3 minutes with skin-side up. Remove skin with spatula and dispose. To serve, place rice in a bowl and top with teriyaki vegetables. Place salmon on top. Sprinkle with chopped green onion. Eat warm.